I know a thing or two about standing out. Born to a Taiwanese mother and an African-American father, I stood out due to my appearance whether I was living in an Asian country or in the States. When I was 13 years, I stood tall at 5 feet 11 inches (180 cm). The next tallest guy in my class was to my shoulders. And because I was so tall, everyone assumed I played basketball. I also stood out when I spoke accent-free Mandarin, because no one expected someone that looked like me to speak anything other than English. While I stood out unintentionally in these situations, we live in a time now where attention is what we crave. 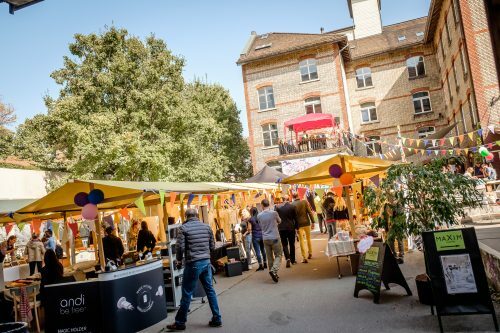 As with most individuals, many entrepreneurs and startups are looking for that edge to get themselves more visibility in the already oversaturated market place, especially during the upcoming holiday season like the Christmas markets here in Zürich and other places in Europe. But what do you do when you really want to project a unique business identity and be seen as special? This past September, the first Impact Markt was held at the Colab, where more than 30 Entrepreneurs and Startups showcased their products. In a place where the market is quite saturated with similar products, I asked several of them how they stood out from the rest. Emotional Appeal – Rodrigo would rather appeal to your senses in person than promote his product through normal marketing channels. That being said, having an inviting and engaging approach to your marketing is a great and simple way to get to know your customers on a more personal level. During the market event, Rodrigo placed his chairs out in a sunny spot and observed how people reacted to them. Exceptional Customer Service – The name itself stands out already. But Jurgita believes that going the extra mile for her customers and treating them like royalty, differentiates her company from the rest. Build Credibility – For Cattleya, building relationships and trust with her target market leads directly to credibility and expertise of her business. She gave samples to potential customers and explained the concept and history behind her product. Creativity – Thinking outside the box and using innovative solutions can help differentiate your business from the next. Jekaterina has been using “Pay What You Feel It’s Worth” in London for 6 years with success and is trying the same creative approach in Zürich. I personally think that stepping outside of your comfort zone and trying something that may not be expected of you, is a way to stand out from the crowd. Writing is out of my comfort zone, but I saw an opportunity to present myself in another medium and this blog post is the result. Standing out and differentiating your product from the rest is not an easy task. But I hope that these tips can guide you in finding that edge for your own endeavors.